Art is my love and passion, when I see a blank canvas I immediately find myself wanting to splash some color onto it and eager to create the next new original piece of art. My original art primarily focuses on abstract, modern, and contemporary pieces. One might wonder "how does abstract art symbolize anything?" and "why would I buy a piece of abstract art when I could paint it myself," then chances are, you haven't taken the time to appreciate "abstract art" and recognize why its so eye-catching and how one piece can provoke a number of feelings based on different views. Once you browse through my paintings here on my blog you will start to notice that each painting will give you a different feeling and sense of imagination - you might love a painting because of the happy exciting feeling it gives you or reminds of you of, where as another viewer may find the same piece calming and relaxing. Abstract art allows the viewer to imagine a story within the painting - capturing and appreciating the feeling they get from the beauty within the piece. You will notice once you purchase an abstract piece of art and place it on your wall, your room will automatically come to life with its imaginative painting. 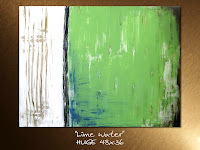 You will notice that an abstract painting will often be very eye-catching because of its bold and bright colors.